KANSAS CITY, Kan. — Her joints are sore, but her memory is as sharp as ever. 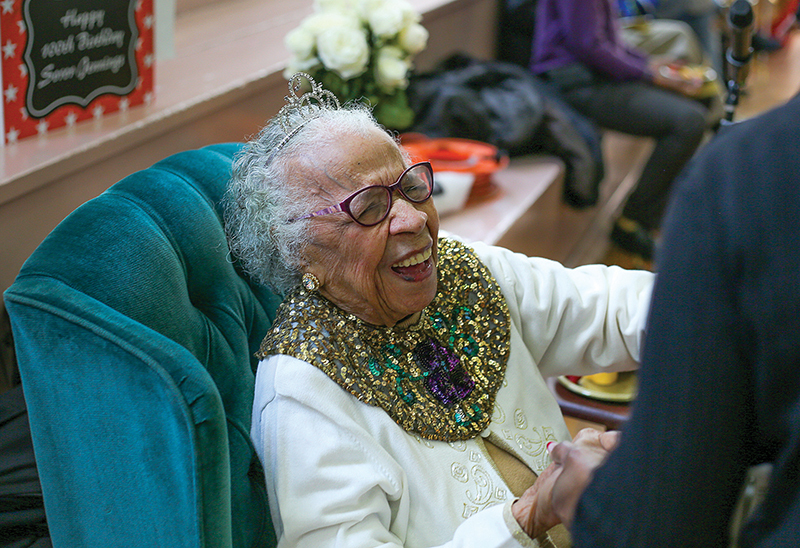 On the day Willie Etta Jennings celebrated her 100th birthday on March 8, the Kansas City, Kansas, resident sat down with The Leaven to share vivid memories of having lived through many of the chapters that fill today’s history books. From the Great Depression to segregation to changing times within the Catholic Church, Willie Etta has experienced both triumph and tribulation. Through it all, she’s remained steadfast in her faith. She willingly divulged the secret to longevity — “don’t die” — and even gave pause to consider what heaven will be like. “What is heaven like? I really don’t know, but I think that I’ll see all of my family and friends,” Willie Etta said. “I hope it will be like a big reunion. Willie Etta’s journey to Catholicism didn’t follow the traditional path. She wasn’t born into the faith; she was raised Methodist. It was her teenage daughter Vergene who encouraged the family to convert in 1958. To this day, Willie Etta has no idea why the Catholic faith was so important to Vergene. Sadly, there was little time to reflect on her oldest daughter’s wishes. Vergene passed away suddenly and unexpectedly from an undetected brain tumor at the age of 15, just one year after having converted. Willie Etta remembers the night she met with the priest at Our Lady of Perpetual Help in Kansas City, Missouri. A friend arranged the meeting to see if Vergene could attend the Catholic school. Although it was Vergene who brought the family into the faith, it was Willie Etta who stayed. Her two younger daughters, Kathy Jennings and DeEdra Lipscomb, received a Catholic education, and Willie Etta grew more active as her children grew older. Willie Etta served in multiple leadership roles over the years, including on the parish council (and as past president), in the choir, as a lector, a food kitchen volunteer and a member of the Legion of Mary. She also served as the director of Catholic Social Services Day Care, was a founding member of the Sanctuary of Hope Prayer and Retreat Center — the first inner-city ecumenical retreat center in Kansas City, Kansas — and is a member of the Knights of Peter Claver. She eventually became a member of the 4th-degree Ladies of Grace division. Over the years, not all the changes within the church have sat well with Willie Etta. In fact, she has strong feelings about the move to stand to take Communion — she preferred the days of kneeling. She also doesn’t care for the uptick in socializing during Mass. Willie Etta’s daughters were witnesses to her devotion as they were growing up. Kathy remembers the many people who stayed with her family when they needed shelter and the many lessons her mother taught her about mercy. Kathy said she has learned more by her mother’s actions than her words, however. “She teaches by example, not by words,” said Kathy. “She treats every person with respect. She always told us to trust in the Lord. And while prayer has always comforted Willie Etta throughout the years, ultimately, she credits the sacrament of reconciliation for bringing her peace — in good times and in bad. “It really helps relieve you of your pressures and troubles,” she said. Willie Etta celebrated her 100th birthday with a Mass and party that included well-wishing friends, family and members of Our Lady & St. Rose Parish in Kansas City, Kansas. Born March 8, 1919, in Lathrop, Missouri, to Reuben and Katheran Lee, Willie Etta was named after her uncle Willie Lee. Willie Etta went to school in Lathrop and Kansas City, Missouri, later attending Lincoln University in Jefferson City, Missouri, where she studied early childhood education. Willie Etta received a certificate of education in 1940. Willie Etta’s pride and joy has been her marriage to LaTell Jennings and the birth of her daughters: Vergene, DeEdra and Kathy. Her life began two years after Henry Ford built the first mass production automobile assembly plant. Bread was a nickel and a movie was 10 cents. She’s lived through 17 U.S. presidents, attended a one-room schoolhouse and lived for many years before indoor plumbing was the norm for the average person. Willie Etta experienced the hardships of the Great Depression and the injustices of segregation. She’s lived through more wars than she can count. She’s transitioned from reading the newspaper to reading the internet. And she remembers her first plane ride and pleasure cruise.